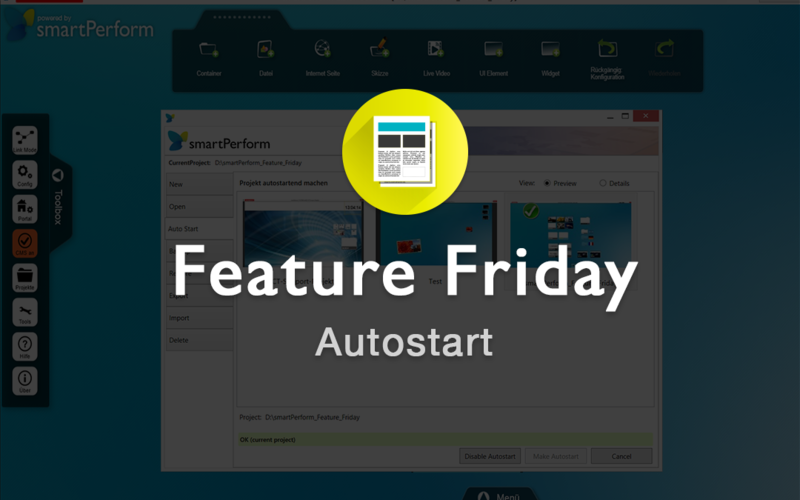 The autostart function of smartPerform is particularly suitable when a smartPerform project is visited by or can be accessible by different people. For example, at trade fairs or in showrooms. If a particular project is set up to autostart, it will start up in presentation mode after the computer is started. It is important that smartPerform is not written into the startup, but makes adjustments directly in the registry. About the “Toolbox” on the left smartPerform surface leads to the project wizard by clicking on “Projects”. In the “Autostart” tab, the project can be selected. If the function is enabled, the appear a green check mark on the top left of the project preview.